The Rena UT-361 is well known in the mailing industry for its durability, speed and the ease at which it applied clear tabs, without fiddling with sensor adjustments. So how do you make a great taber even better?! 1st you add a speed adjustment knob, so you can run at the speed that is right for you and your job! 2nd you build in a feeder so you don’t need to purchase a separate feeder! When you’re all done, what do you have? You have the Rena T-350! *NOTE! The tabs for this machine are 13/16″ and do not meet the current USPS requirements for 1″ minimum. However, this is still a great machine for many packaging applications! 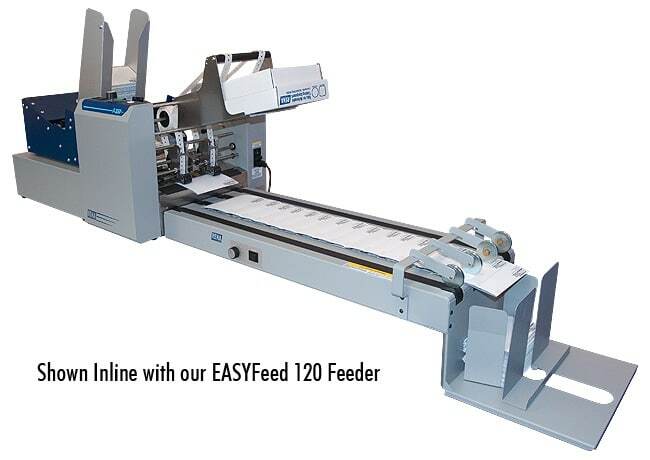 Then when you need a more flexible feeder, with a larger feed capacity, add an external feeder like the EasyFeed 120. Feeding mail pieces, open end 1st is never easy, but you can make life a lot simpler by using a good feeder! Then you have a desktop taber, 2nd to none, that has no problem applying completely clear tabs – wafer seals. In fact, this tabber doesn’t even have a tab sensor! It has 1 paper sensor and that is it. 1/21/16 Update: The tabs for the Rena t-350 and UT-361 have become expensive and hard to come buy! Therefore, we do not recommend purchasing this taber! Give us a call at 866-430-2874 and check out other tabbing alternatives here.